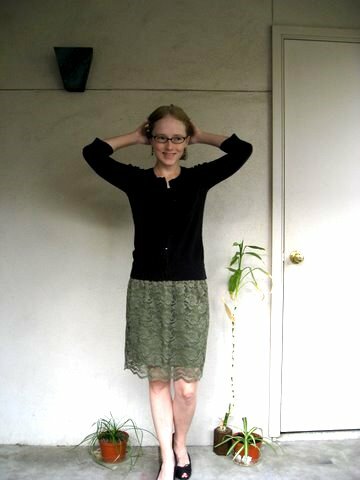 I bought this olive green lace skirt at Target 5 minutes before closing on Sunday. I meant to try it on and then was surprised to hear the message that the store was closing in 15 minutes and I hadn’t started on my list (contact solution, toilet bowl cleaner, and the like) so threw it in my cart and figured for $4.24 it would probably work out enough to make it worthwhile. The first photo makes it look kinda sheer because of the shadow, but the other pictures show that it’s decent. The last few days of pictures have been taken in the morning before work with much of the balcony in shadow. Before long it will be dark when I leave for work and dark again when I get home. It’s not even November yet! I don’t remember being this panicky about losing the sun last winter, I’m a little nervous about it. October 27, 2010. Tags: clothes, shopping, Target, What I Wore to Work Today. Pictures, What I Wore to Work Today, Words.